When you consider ease of use, the platform needs to be easy for your customers to browse, add to their cart, use discounts and checkout. Nothing scares away a customer faster than not being able to find what they want or losing the items in their carts. Of the following ease-of-use features, WooCommerce is the only one that falls short. While pricing shouldn't be the top consideration it is one of the most important if your business is just starting out or beginning to grow. WooCommerce doesn't list package prices because they design a custom package for your business. The other four platforms offer a variety of options starting around $25 a month for a very basic e-commerce solution. All of the following prices reflect the monthly prices. Shopify: Three packages available: Basic Shopify at $29, Shopify at $79 and Advanced Shopify at $299. Magento: Under the Zoey small business option, $89 for Professional, $199 for Business and starting at $599 for Premier. WooCommerce: Pricing is determined by how the package is designed. BigCommerce: Four available options. Standard at $29.95, Plus at $79.95, Pro at $199.95 and an Enterprise Plan priced on the level of customization. The design of your e-commerce site can make or break your sales. Highly dependent on the industry, your customers expect your site to reflect their tastes, be easy to navigate and express the same level of sophistication as your brick-and-mortar stores when appropriate. Other than complete customization, the following templates are available. Ultimately you don't want anything to go wrong with your e-commerce site. But when problems do arise, you need to know that support is there to help you resolve them. Of the five e-commerce platforms, WooCommerce and Magento do not offer 24/7 support. WooCommerce offers a help option through your e-commerce dashboard and Magento requires you to submit a support ticket. 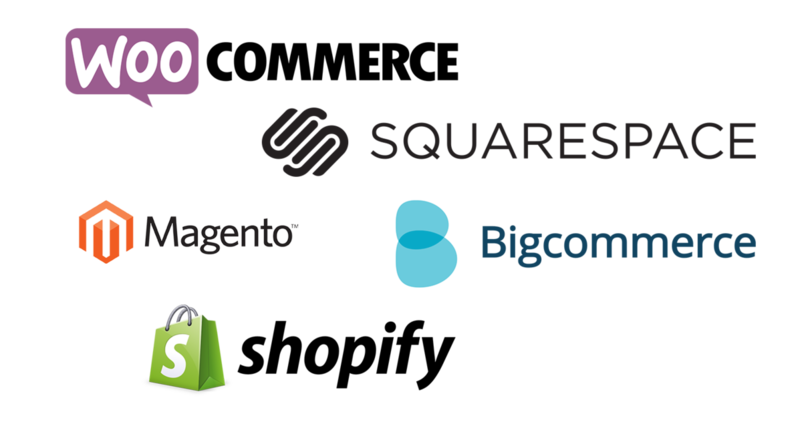 BigCommerce, WooCommerce and Squarespace provide the ability for APIs, but implementation may be difficult for beginners. Shopify and Magento both offer easy to use options for integration,with over 35 and 100 API endpoints respectively. You know your business better than anyone, and your success is important. All of the platforms have benefits; but after comparing, Shopify tops out as the best e-commerce reviewed in all categories. Try a free trial today to see how it can work for you.